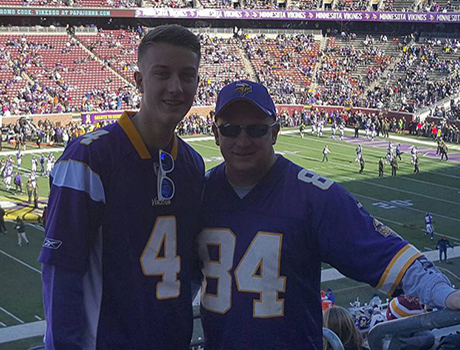 Christoph from Germany and host dad Mike cheer on the Vikes! When my host dad invited me to a Minnesota Vikings professional football game, I was really excited! I was right to be excited too, because it was really fun with a great atmosphere and a giant stadium. Luckily, I have been watching a lot of my high school team’s games, so I knew most of the rules. When I was confused, my host dad was glad to explain. Everyone asks me if it was cold. Yes, especially since I forgot my gloves. But who cares? The most important thing is that the Purple People Eaters prevailed!